For whatever reason, my husband has been on an egg roll kick lately. He spends his nights dreaming up new egg roll possibilities – mostly with ingredients that you’d think have no business in an egg roll. That is, until you try it. I’ll share his egg rolls creations with you over the next few weeks, but today’s recipe kicked it all off. I know, egg rolls for breakfast sound weird. But it has quickly become my favorite breakfast dish. And it’s so easy to make. Place bacon strips on an aluminum foil covered baking sheet. Bake at 425 for 10 minutes. Flip bacon over and continue baking for another 5 minutes, until bacon becomes crispy. Remove and chop the bacon. Lightly saute the diced jalapeño. In a mixing bowl, crack the six eggs and whip. Add garlic salt, onion powder, black pepper, cayenne pepper, paprika and oregano. Mix in well. Add jalapeños, cilantro and bacon and mix. Lightly butter a pan and cook the egg mixture. Scramble and remove from heat. Assemble each egg roll by laying out an egg roll wrapper in a diamond formation. Lay the eggs across the middle. Add some grated cheese. Take the bottom point of the wrapper, fold up, and tuck under the filling. Fold in each side. Add water to the bottom of the edges to help it stick. Roll the rest of the egg roll up and lightly water the edge to help it seal. Once all egg rolls have been created, place each egg roll, fold-side down, in a pan of heated vegetable oil, about 1-inch full. Fry until each side is a nice golden brown and remove from the oil. Place on a plate lined with a paper towel and allow to rest for a couple minutes before serving. Dip the egg rolls in maple syrup. It might sound weird, but it’s insanely good. Those are awesome. Totally something that my husband and I would love. This combo sounds great to me!! Look forward to seeing more! That sounds good to me.. I Like this combination! You know what its called an "egg" roll, so I say why not put "eggs" in an eggroll. It looks yummy! Dip them in maple syrup? That does sound strange, but I am going to have to try it! 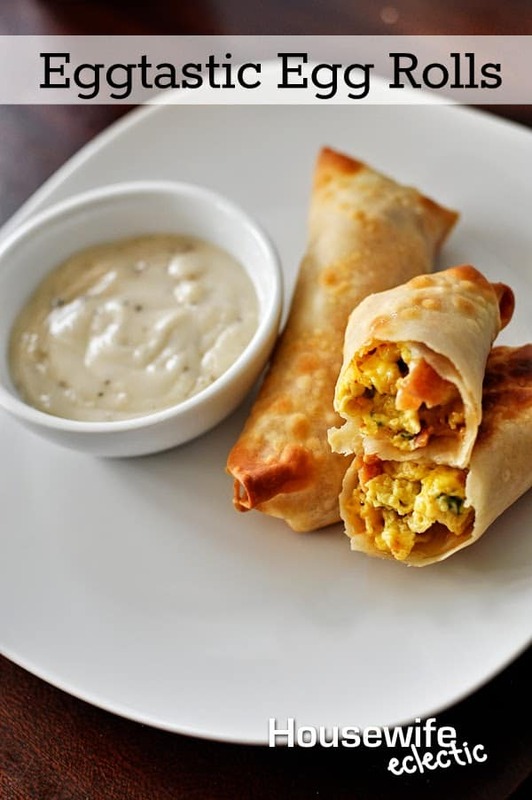 These egg rolls look like they would taste very delicious, I need to make these! My husband would love these. They look great! love the name! never thought of putting eggs in egg rolls but it sure makes sense! I don't normally eat egg rolls but this way would be delicious! I miss eating bacon. Your dish looks good and easy to make. Nice version of eating bacon and eggs. ANything with eggs and I'm sold! Sounds yum! I've never made egg rolls but we love to eat them. I'll try now with your easy recipe. Thanks for partying with us at Merry Monday. These look scrumptious. Thank you for sharing with us at #HomeMattersParty . We would love to have you again next week.